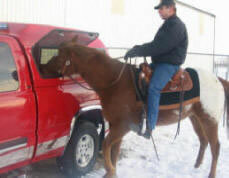 Terry Nowacki on a sniffer horse training outing. A horse trainer is showing the world that scent-detecting horses can take their place alongside dogs in playing a role in search and rescue operations. Terry Nowacki, of Minnesotta, has been running courses for the last seven years showing how horses can be trained to follow scents - anything from people to narcotics. "It works so good it is unbelievable," says Nowacki, who only recently completed a course for search and rescue personnel in British Columbia, Canada. Nowacki, a horseman for some 48 years, says riders generally take more training than the horses. Horses quickly learn through reward-based training what to do, but up to 80% of the effort goes into teaching the riders. "To horses this is just a game," he says. "They have known all their lives how to follow scents. What we do is show people how to read the signs and allow the horse to follow the scent. "People do not understand how important scent is to a horse," he says. He cites the example of releasing a horse into a corral. "The first thing they are going to do is go scenting," he says. Through that, the horse will know who has been in the corral before. Nowacki did not initially set out to train horses to follow scents. He became involved in training dogs for search and rescue work. "Winter came along ... we had one foot, then two foot of snow. Then it wasn't quite so much fun," he says. "So I experimented with the horses," he says, pointing out that moving in snow is rather easier when in the saddle. Using horses for their scent-detecting ability is nothing new, he points out. Native Americans had long known about their ability and had used horses to find buffalo herds, even marking their horses around the eyes and nostrils to indicate their sensing ability. A rider must give their horse its head to allow it the freedom to follow a scent. "The reason it hasn't caught on is that people don't understand how to read the horse correctly. This is the whole key to it." Nowacki says it is important to draw the distinction between the ground scent, which the likes of bloodhounds will follow, and air scent, which is the horse's forte. Dogs, too, he points out, can be trained to detect air scent as opposed to ground scent. He says there are several key stages in his training programme, which is usually run over three days. The first is recognising the signs when a horse is searching for a smell. The second involves recognising the signs that the horse has detected a scent and is following it. Similarly, there will be signals if the horse loses it again. Crucial to the technique's success, he says, is giving the horse the freedom to follow the scent, which flies in the face of more traditional horsemanship. "In traditional horsemanship, we make them do what we want," he points out. Unless horses are given the freedom to do so, they won't follow a scent at all, he says. Riders drop the reins and let the horse get on with the job. "It kind of goes away from traditional horsemanship." He describes the first stage of the training as being like playing hide and seek with a three-year-old child. The horse receives a treat when they find the person. There is, he says, a range over which horses will be able to detect the smell, and the technique works better in certain kinds of country. Wind direction is naturally another important factor. It is best suited to country dominated by low brush or areas of open country with long grass - very much like Nowacki's northern Minnesotta. Under ideal conditions, horses have been known to detect scents from up to 400m (a quarter-mile) away. In his recent Canadian course, the best detection performance was over a distance of 88m (288 feet). Typically, the horses were managing between 30 and 60m (100 and 200 feet). The range is more than adequate to be finding anyone lying in long grass or scrubland, or off to the side of a trail. Nowacki said that on the last day of the Canadian course a person was hidden alongside a 2km (1.25 mile) trail. Participants were told to ride the trail and keep their eyes firmly fixed on the horse to read the signs. A horse performing narcotic detection. The horse was trained for demonstration purposes and was not actually used for law enforcement. Afterwards, each rider was asked to name the position along the trail where they felt it was most likely the person was hidden. Eighty per cent got it right. Nowacki says the technique with horses doesn't work like you might see on a crime show, where distressed family members bring out an item of a missing relative's clothing for a bloodhound to follow. What horses are following is a general human scent - not the scent of a particular person. He uses the trail-riding test in Canada as an example. A horse detecting the scent of a person as they wander along a trail will acknowledge it just as a hiker would do if they passed another person. The key is reading the signs - which 80% of course participants managed to do in this example. "Many people think that this indication is head up and looking alert. But it's actually a series of signs, including dropping the head. People have learnt to just ignore that kind of thing." What does he do if the horse finds the wrong person, such as another searcher? "You simply reward the horse and move on - as you would with an air-scenting canine. "The horses think it's the best game in the world." He says most course participants are surprised by their horses' abilities. "We always get good results," he says, adding that he learns a little more himself with each course. Nowacki began teaching the technique in 2001. 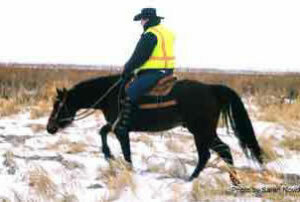 He has run about 24 courses so far, mostly for search and rescue bodies, but also for some natural horsemanship groups. He has also been invited to speak about it. He says horses taught the technique can have a short attention span to start with, "but it grows as they go on". While he recommends course participants keep schooling their horse in following scents, it seems the animals have little trouble remembering it. He believes air-scenting horses will gain greater acceptance in search-and-rescue circles over coming years, and expects standards to be developed and formal field trials to be held, with increasing development for its use in search and rescue. "If you go back 10 years from now, you will find very little information about it anywhere." It has come a long way since then, he says. 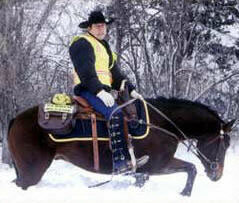 He sees horses as being another tool for search teams, as opposed to replacing dogs. Horses can cover long distances, often through quite difficult terrain. Nowacki, who lives in the town of Argyle, has been a professional horse trainer by occupation for about the last 20 years, mostly breaking horses to saddle, but he also does show training. He also schools cow horses, in an area where stock horses dominate. In 2001 he wrote what is believed to be the world's first training manual on air scenting with horses.